If you’re a user of Facebook’s Android App, you probably know how limited it is when directly compared to the iPhone version, and even Facebook’s mobile website. While the gap hasn’t been bridged yet, Facebook has released version 1.6 of its Android client that brings it one step closer to that goal. Version 1.6 brings two major new features to the table of features: direct video uploads from your Android device, in line with what’s available on the iOS version, and page viewing, although still more limited than its iOS counterpart. There should also be minor news feed improvements. Video uploading should be pretty self-explanatory: by clicking the camera icon next to the “What’s on your mind” text field, users will see a new video option. From there you’ll be able to record a video using the built-in camera on your Android device and upload it straight away to your Facebook profile, just like the way you would upload pictures. Users are also finally able to view Pages, a feature that was been missing from previous versions. By tapping them in the news feed, they can visualize all updates from those pages. 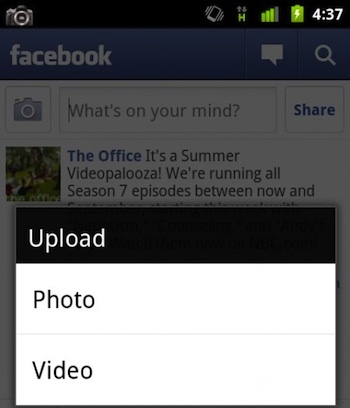 In addition, the news feed is now also able to load more types of content. Sadly, however, there’s no way to search for specific pages: users will have to locate a page in the news feed in order to view its contents, something that is still unthinkable on the iOS version. 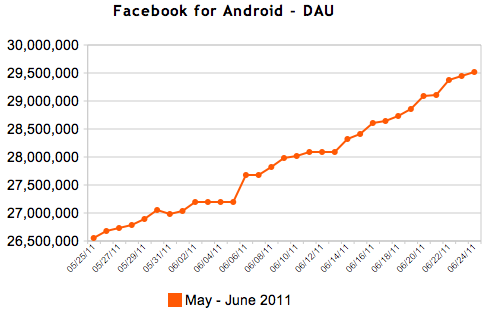 Facebook for Android’s popularity has soared over the last month, growing at an even faster pace than the iOS client, despite the lack of functionality, from just over 26 million a month ago to nearly 30 million yesterday. 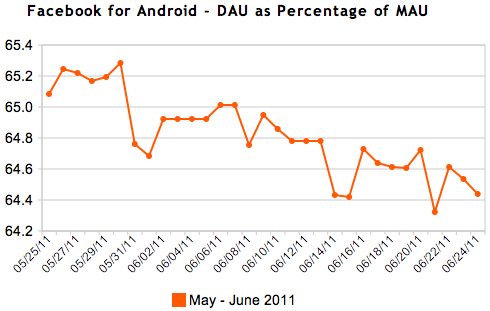 On the other hand, the share of users who use the App daily has steadily declined. For a long time, iOS was the only mobile platform with its dedicated Facebook App, until the first version of Facebook for Android made its way to the Android market in September 2009. At the time, there wasn’t much to see, aside from a new feed and posting features. Less than one year later, however, Facebook for Android was completely overhauled, making the Android App look a wee bit similar to its iOS counterpart, but still lacked tons of features, and still does. Over the last year, the Android client has been updated to add several new features, such as Facebook Chat support. Core features like Photo Tagging, however, are still lacking.